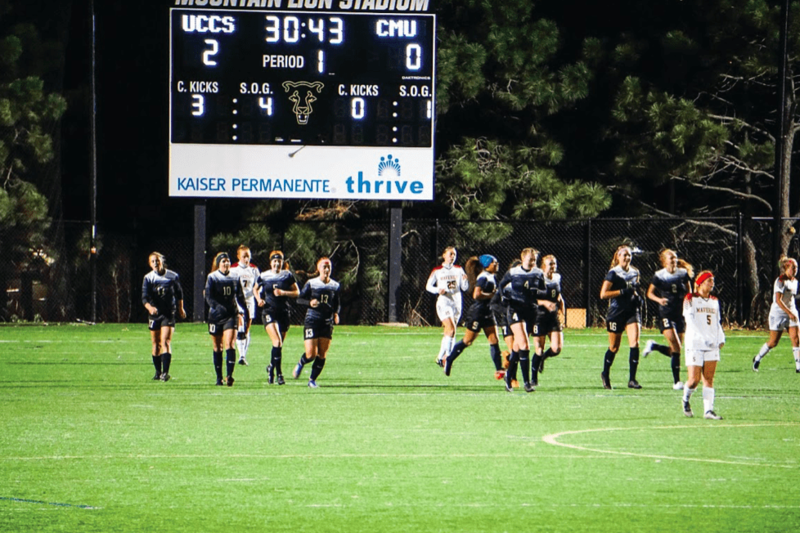 The women’s soccer team lost 2-1 against Carson-Newman University in the NCAA Division II Women’s Soccer Champion semifinals on Nov. 30, ending their historic season as the first program as part of UCCS Athletics to reach the national semifinal. Anna Gregg scored the Mountain Lions their first and only goal of the game five minutes after Carson-Newman scored the winning goal in minute 70. The team finished the season with a record of 17-5-1, completing the best season in program history. The Mountain Lions were ranked at No. 23, while Carson-Newman was ranked at No. 2. Prior to this season, women’s soccer had not qualified for the NCAA tournament. In the offseason, former Colorado College Coach Sian Hudson was hired in January. One member of her coaching staff and four players followed her from CC, and another eight signed on in February to join the Mountain Lion program. The beginning of the season started slowly as the team had two losses, taking the L to St. Edwards 0-1 and Dallas Baptist 1-2. Following this, however, the team won the 12 of the next 14 games to earn the No. 3 seed in the RMAC playoffs. Before the 2017-18 season, the team had never made it to the RMAC Championship, but that changed on Nov. 3 after a win against Colorado School of Mines in the semifinals. Continuing the historic season, the Mountain Lions took the win against Colorado State University Pueblo on Nov. 5 to win their first ever RMAC Championship. With their conference win, the team received an automatic bid to the NCAA Tournament. The team received the No. 2 seed in the South-Central Region and hosted the first and second rounds while having a first-round bye. In the second round, they defeated West Texas A&M 1-0. During the third round in San Diego, California, the team played Colorado Mines in a rematch of the RMAC semifinals. Defeating Colorado Mines 3-2, The team took the top spot in the South-Central region before competing against University of California Dan Diego, champions of the West region. UCCS advanced to the NCAA Division II Women’s Soccer Final Four following their win against UC San Diego. For more information on women’s soccer, visit gomountainlions.com.